Well, my 69 Rambler is on its way to completion so I thought I would start my search for another car. I have another 68 2-door Rambler American original one owner car but I now have decided to sell it since I already have my 69. 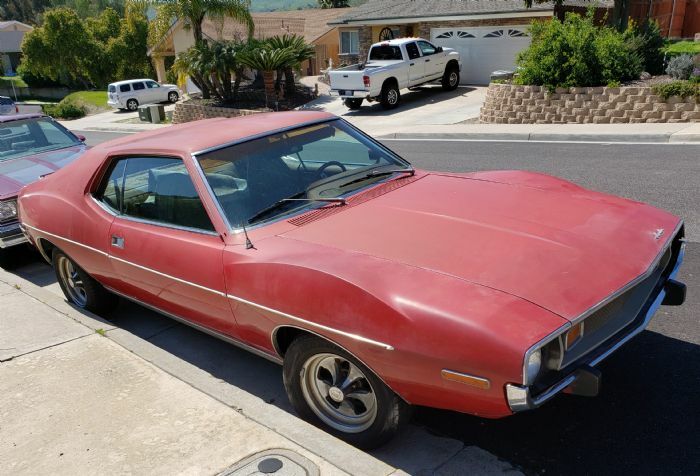 So, I have located a 73 Javelin survivor (one owner car) that a friend purchased simply to save after the owner died and the wife and kids decided not to keep it. I am in final negotiations for the purchase. I am posting because I don't know a lot about Javelins although I like 73 and 74 humpsters and ones that are fairly basic (for my budgetary needs). 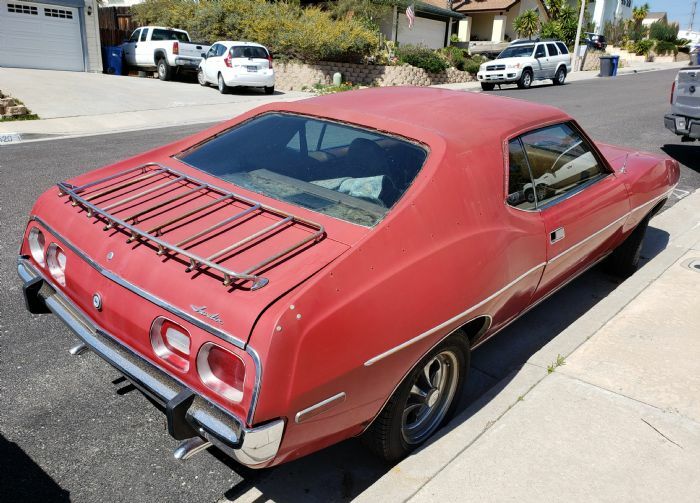 The Javelin has been in southern California for its life. It was a Orange car but was repainted once in red. One day I will repaint it the original Orange color. From a rust perspective it is almost perfect (some bubbling at the bottom of the driver quarter panel) but no rust through anywhere. Never wrecked (was up on stands for 17 years in a garage) until my friend purchased it. I don't think it has a single dent on the car. It has a very nice running 360, air conditioning not hooked up, power brakes and steering. It did have a vinyl roof that was removed before painting it red years ago. The interior is intact but needs carpet and reupholstering, including seats and a few cracks in the plastic gauge panels. All the gauges and electrical work. Door panels are good (just dirty from sitting), headliner is perfect. My immediate plans are simply to buff it out and drive it. By the way, it has all the emblems and additional trim from the drip rails, back window and vinyl. I'm not a big fan of vinyl so I won't reinstall vinyl but was thinking of reinstalling the trim one day and painting it black in lieu of the vinyl replacement. Other than that, I plan to keep it mainly original. Welcome to humpster land! Most likely the grill can be fixed and the 73 & 74 Javelin grills are around since they're the same for 2 years. The console lid was available thru the vendors but it's been a few years since I bought one. Post a wanted ad for what you're looking for. I have a bunch of interior stuff that one day I need to start getting rid of. Thank you for the information! Your Hemilina is awesome by the way! It is not too hard to find parts for these cars. There are a number of people that repair grills if you don't feel capable of doing it. 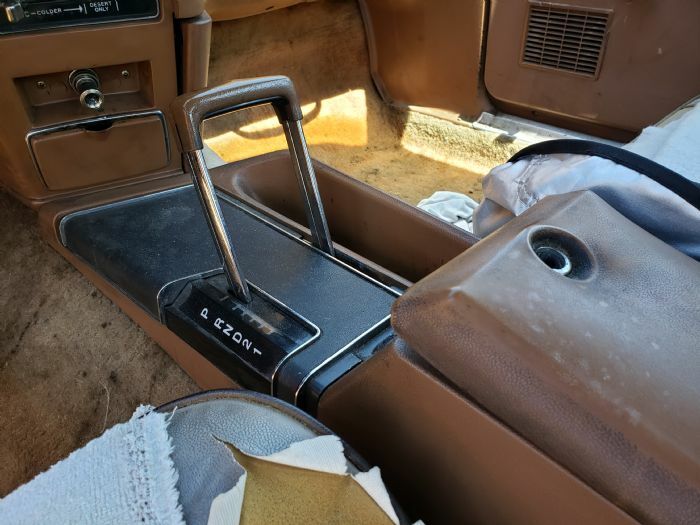 Look at classiccarplastics.com. Shelby Coleman here on the forum also does grill restorations. Good luck with your project, you have found a great car to start with. M.D. Racer, thanks for the information and leads. I appreciate it. The more I have reviewed 73's for my price, I think I am fortunate to have found a gem from a body perspective. I took it over to my paint and body guys today and they were stunned about the great condition of the body. Nonetheless, still a nice driving project that I can do over time. Looks good from what can be seen in the pictures. I am surprised at how nice the roof looks considering it had a vinyl top at one point in it's life. Looks like it has a rear window blower too. Neat option. I hope it works. So many of the 73/74 parts interchange I think your not going to have too much of an issue getting parts. Can't wait for the restoration thread to start. Thank you for the tips. Bought it. Ramblin man and a Humpster man. Let the fun begin. So, you are going to do what camjam did and make it a driver? Dosent look too bad, outside of seats and rear package tray. My 73 had disc brakes, sports wheel with console auto, rear blower fan, a/c and power brakes when i purchased from the orignal owner. Yours has the multi plex fm, which i did not have in mine. Its not so common to have a 73 with vinyl, i seen more 74 Javelins with vinyl. Please post some before and after photos when you buff it. Bet it'll look 25 years younger with the faded paint burnt off a little. Thanks. Will buff the new baby and start on the interior (seats and package tray are in "tatters" as Mick Jagger would say. Though tattered those original seats are very comfy! The 360 has around 100k on it but it runs great, does not leak nor burn oil. The brakes and hoses were re-done, stops effortlessly, love the discs up front. The air conditioning compressor was taken off to put a new timing cover on (leaks no more). I'll get the a/c back together. Power steering pump does leak so I'll replace it or install new O rings (any thoughts on that)? Rebuilt steering box was installed recently with new Pitman arm and tie rods. Look ma, no trunnions!! Aligned last week. It's a driver for sure. 304-dude, I saw camjam's thread on his Jav. A real beauty and inspiration. Don't know if I can live up to Cam's great work. When I buff it out I'll post a before and after. Until then, I'll take turns with it and the 69 Rambler (which flat out hauls arse). The white 68 American I bought last year in Arizona from a wonderful 95 year old WWII vet original owner (original project car or great donor) will need to go. Giddy as a kid on Christmas morning. But still on another learning curve!